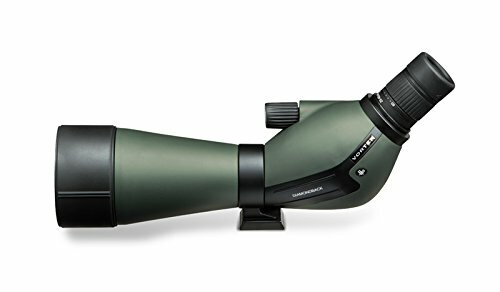 Are you looking for a brand new spotting scope to improve your hunt? Perhaps the Vortex Optics Diamondback could be the perfect choice for you. Find out what we think about this much-hyped scope in our review. Are you in the market for a new spotting scope? If so, you might be wondering whether the Vortex Diamondback spotting scope could be the one for you. Finding the right balance of performance and affordability isn’t always easy, but the Vortex Diamondback has received some positive reports from its users. So, can you depend on them or will you be making a purchasing mistake if you go for this model? You’ll find out what you need to know in this Vortex Diamondback spotting scope review. When you open the box of the Vortex Optics Diamondback, you’ll see that it isn’t as small as you might have been expecting. This scope is marketed as a compact spotting scope, but in fact, it’s more of average size, weighing around 3lbs and being a little bulky in construction. While this may be an issue if you’re looking for an especially portable model, most users won’t find its size or weight to be too much of a problem. It also comes complete with a carrying case with integrated strap, a lens cleaning cloth, a thread-on eyepiece cover, and an objective lens cap so you’ll have most things you need to get up and running straight away. A good quality, comfortable eyepiece can make all the difference to your experience when it comes to using a spotting scope. This model has an eyepiece which features an extendable plastic eyecup which extends to around 0.37”. This improves focused viewing, and it can easily be extended by rotating the plastic housing. The housing is simple to turn, however, it has a plastic clunky feel and it doesn’t stay well in position. Luckily, it’s rarely used so it won’t have too severe an impact on your viewing of objects at a distance. On the upside, the zoom ring to the front of the eyepiece features rubber serrations for a better grip even in inclement weather. 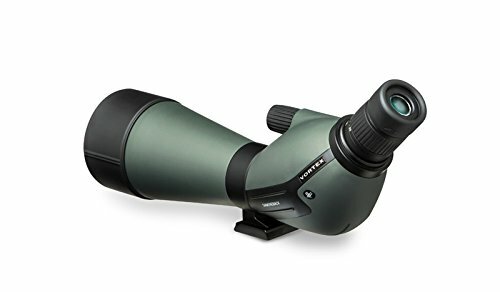 You can rotate the eyepiece through the entire 20-60 x zoom range with fairly light resistance and there are markings on the eyepiece however it’s quite difficult to identify the precise zoom power which the eyepiece has been set to. The body of the scope itself features a hard rubberized armor. Although it isn’t a fully armored coating like many of the other spotting scopes on the market, it feels quite durable and protective. On top of the tube, you’ll find the focus knob in a well-located position. Unlike many other scopes which feature both a fine and coarse knob, the Vortex Optics Diamondback only has a single focus knob which allows for faster focusing with a surprisingly sharp image. The base is flat and has been threaded with a standard tripod threading so it can be used with any universal mount and tripod. This gives you greater flexibility of use. Recommended Reading: Did this scope make the cut when we unveiled our favorite spotting scopes? 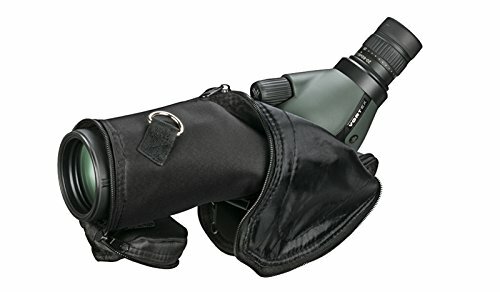 This spotting scope features an extending plastic sunshade which extends a full 1.25 inches and which is fully rotatable through 360 degrees. The two ridges on opposing sides are also useful as aiming marks if you’re aligning your scope with your desired target. One extra feature is the lens cap. It features a pinch style lock to keep it attached to the front of the spotting scope in order to protect the objective lens between uses. The Vortex Diamondback spotting scope is surprisingly affordable and yet delivers a fairly decent standard of performance. If you turn the zoom up to the max, you’ll find the brightness will diminish and the quality of the picture degrade, but that’s nothing that you wouldn’t expect. One issue with this spotting scope is the lack of a fine focusing knob which hinders the quality of the picture further at a higher magnification. However, if you’re keeping the magnification level down to the 20 – 40 x range, you’ll find its performance is pretty good even in varied weather and lighting conditions. The Vortex Diamondback Scope has a higher eye relief which allows you to carry on wearing your glasses or sunglasses while using it. While it isn’t the most comfortable spotting scope for glasses wearers it’s pretty simple to operate thanks to its lack of complex features or controls. If you’re interested in finding a basic spotting scope that offers reasonable quality at an affordable price, you won’t go far wrong with this model. 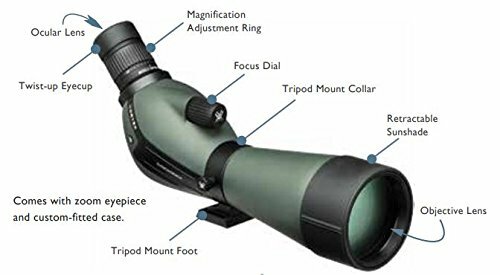 A lot of the construction of this spotting scope is made from plastic and this makes it slightly less durable than some other models, however, you can rest assured that your purchase will be well protected under the manufacturer’s warranty to give you extra peace of mind. Vortex Optics products come with an amazing lifetime warranty so be assured that you’re very well covered. When everything’s taken into account, the Vortex Diamondback Scope is a decent choice for anyone who wants an affordable, basic model which is easy to operate, even for a beginner and which offers a reasonable level of performance. While its construction isn’t as strong or durable as some of its competitors, the Vortex Diamondback spotting scope comes in at a surprisingly low price and works pretty well in the field. If you’re looking for an exceptionally small and portable scope, this might not be the one for you but if you want a functional, cost-effective spotting scope for use on your next hunt, you won’t go far wrong if you select this model. Its rubber armor coating helps to guard against damage from accidental drops or falls while its foolproof operation makes it a breeze to use on the fly. In short, the Vortex Diamondback spotting scope makes a good entry level choice for anyone who is new in the field or who is on a tight budget.